Offering you a complete choice of products which include automatic box strapping plant with servo winder, pp strapping extrusion plant, pp box strap extrusion plant, pp strapping extrusion line, box strapping band making line and box strapping band making plant. We are successfully ranked amongst the foremost manufacturer, exporter and supplier of Automatic Box Strapping Plant. The offered strapping plant is suitable for manual clamping application & heat-sealing application. This strapping plant is manufactured by optimum grade raw material and sophisticated technology in synchronization with set standard. Offered strapping plant is examined under the direction of professionals to ensure the flawlessness. With our expertise in this domain, we are able to offer a superior quality range of PP Strapping Extrusion Plant. The provided extrusion plant is available in different specifications as per the requirements of our esteemed clients. This extrusion plant offered by us is used for various packing application in different industries. 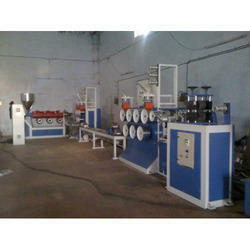 Customers can avail this extrusion plant from us at affordable rates. Fuma has developed High-tech PP Box Strap Extrusion Machine to produce straps from Polypropylene granules. PP Box Strap Extrusion Machine Strap is suitable for manual clamping application, heat-sealing application and fully automatic machine heat-sealing application. We offers various models PP Box Strap Extrusion Machine for single line, two lines, three lines and four lines straps with width of 6mm, 9mm, 12mm, 16mm and 19mm and Co-Extrusion Plants for Two Layer or Lining on straps with high production range from 35kg to 150 kg/hrs capacity. 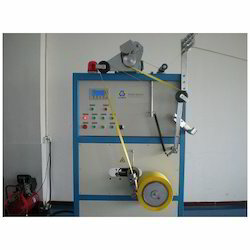 PP Box Strap Extrusion Machine Extrusion Generates Plastic Sections of Continuous Length through Plastic Extruder. Plastic Granules are melting by required elements through Plastic Extruder to form a furnished product. PP Box Strap Extrusion Machine Process is carried out through Various Components like Extruder, Quenching tank, first godet, hot water tank, stretching godet, online single color printing machine, embossing unit, Stabilizing unit, third godet unit and wind on core winder. Fuma has developed High-tech PP Strapping Extrusion Line to produce straps from Polypropylene granules. PP Strapping Extrusion Line Strap is suitable for manual clamping application, heat-sealing application and fully automatic machine heat-sealing application. We offers various models PP Strapping Extrusion Line single line, two lines, three lines and four lines straps with width of 6mm, 9mm, 12mm, 16mm and 19mm and Co-Extrusion Plants for Two Layer or Lining on straps with high production range from 35kg to 150 kg/hrs capacity. PP Strapping Extrusion Line Extrusion Generates Plastic Sections of Continuous Length through Plastic Extruder. Plastic Granules are melting by required elements through Plastic Extruder to form a furnished product. PP Strapping Extrusion Line Process is carried out through Various Components like Extruder, Quenching tank, first godet, hot water tank, stretching godet, online single color printing machine, embossing unit, Stabilizing unit, third godet unit and wind on core winder. By keeping track with the current market developments, we are actively engaged in offering Box Strapping Band Making Machine. This machine is checked at our end on various parameters in order to deliver a flawless range. Offered machine is developed by our skilled professionals utilizing the advanced technology and superior grade raw material. Customers can avail this machine from us in various specifications at market rates. Capacity Up to 70 kg per hrs. 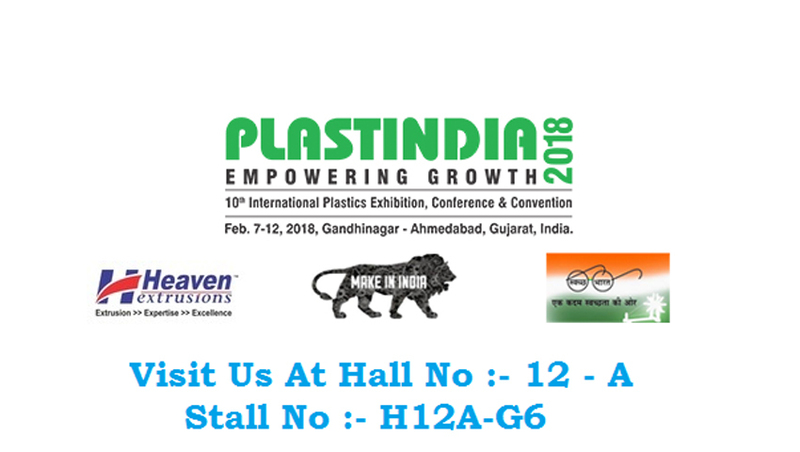 Heaven extrusions has developed High-tech Box Strapping Band Making Machine to produce straps from Polypropylene granules. Box Strapping Band Making Machine Strap is suitable for manual clamping application, heat-sealing application and fully automatic machine heat-sealing application. We offers various models Box Strapping Band Making Machine for single line, two lines, three lines and four lines straps with width of 6mm, 9mm, 12mm, 16mm and 19mm and Co-Extrusion Plants for Two Layer or Lining on straps with high production range from 35kg to 150 kg/hrs capacity. 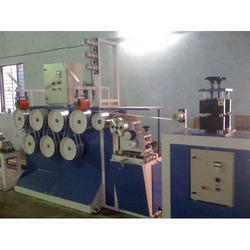 Box Strapping Band Making Machine Extrusion Generates Plastic Sections of Continuous Length through Plastic Extruder. Plastic Granules are melting by required elements through Plastic Extruder to form a furnished product. Box Strapping Band Making Machine Process is carried out through Various Components like Extruder, Quenching tank, first godet, hot water tank, stretching godet, online single color printing machine, embossing unit, Stabilizing unit, third godet unit and wind on core winder. Fuma has developed High-tech Plastic Box Strapping Plant to produce straps from Polypropylene granules. Plastic Box Strapping Plant Strap is suitable for manual clamping application, heat-sealing application and fully automatic machine heat-sealing application. We offers various models Plastic Box Strapping Plant for single line, two lines, three lines and four lines straps with width of 6mm, 9mm, 12mm, 16mm and 19mm and Co-Extrusion Plants for Two Layer or Lining on straps with high production range from 35kg to 150 kg/hrs capacity. 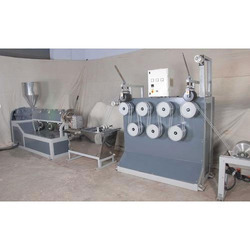 Plastic Box Strapping Plant Extrusion Generates Plastic Sections of Continuous Length through Plastic Extruder. Plastic Granules are melting by required elements through Plastic Extruder to form a furnished product. 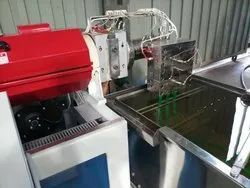 This Process is carried out through Various Components like Extruder, Quenching tank, first godet, hot water tank, stretching godet, online single color printing machine, embossing unit, Stabilizing unit, third godet unit and wind on core winder. Fuma has developed High-tech Fully Automatic Strapping Extrusion Machine to produce straps from Polypropylene granules. Fully Automatic Strapping Extrusion Machine Strap is suitable for manual clamping application, heat-sealing application and fully automatic machine heat-sealing application. We offers various models Fully Automatic Strapping Extrusion Machine for single line, two lines, three lines and four lines straps with width of 6mm, 9mm, 12mm, 16mm and 19mm and Co-Extrusion Plants for Two Layer or Lining on straps with high production range from 35kg to 150 kg/hrs capacity. 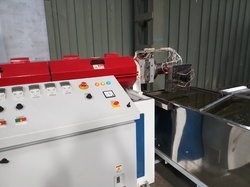 Fully Automatic Strapping Extrusion Machine Extrusion Generates Plastic Sections of Continuous Length through Plastic Extruder. Plastic Granules are melting by required elements through Plastic Extruder to form a furnished product. Fully Automatic Strapping Extrusion Machine Process is carried out through Various Components like Extruder, Quenching tank, first godet, hot water tank, stretching godet, online single color printing machine, embossing unit, Stabilizing unit, third godet unit and wind on core winder. Being a customer focused organization; we are manufacturing, exporting and supplying PP PET Box Strapping Plant. Our offered strapping plant is manufactured keeping in mind the industry norms by using advance techniques. Furthermore, this strapping plant known for its user-friendly nature & performance. Offered strapping plant is available in numerous specifications to choose from. Production Capacity: up to 150 Kg/hrs. Fuma has developed High-tech PP Strapping Extrusion Plant to produce straps from Polypropylene granules. PP Strapping Extrusion Plant Strap is suitable for manual clamping application, heat-sealing application and fully automatic machine heat-sealing application. We offers various models for PP Strapping Extrusion Plant single line, two lines, three lines and four lines straps with width of 6mm, 9mm, 12mm, 16mm and 19mm and Co-Extrusion Plants for Two Layer or Lining on straps with high production range from 35kg to 150 kg/hrs capacity. PP Strapping Extrusion Plant Extrusion Generates Plastic Sections of Continuous Length through Plastic Extruder. Plastic Granules are melting by required elements through Plastic Extruder to form a furnished product. PP Strapping Extrusion Plant Process is carried out through Various Components like Extruder, Quenching tank, first godet, hot water tank, stretching godet, online single color printing machine, embossing unit, Stabilizing unit, third godet unit and wind on core winder. Fuma has developed High-tech Polypropylene Strapping extrusion Plant to produce straps from Polypropylene granules. Polypropylene Strapping Plant Strap is suitable for manual clamping application, heat-sealing application and fully automatic machine heat-sealing application. We offers various models for Polypropylene Strapping extrusion Plant single line, two lines, three lines and four lines straps with width of 6mm, 9mm, 12mm, 16mm and 19mm and Co-Extrusion Plants for Two Layer or Lining on straps with high production range from 35kg to 150 kg/hrs capacity. Polypropylene Strapping extrusion Plant Extrusion Generates Plastic Sections of Continuous Length through Plastic Extruder. Plastic Granules are melting by required elements through Plastic Extruder to form a furnished product. Polypropylene Strapping extrusion Plant Process is carried out through Various Components like Extruder, Quenching tank, first godet, hot water tank, stretching godet, online single color printing machine, embossing unit, Stabilizing unit, third godet unit and wind on core winder. Fuma has developed High-tech Box Strapping Plant to produce straps from Polypropylene granules. The Strap is suitable for manual clamping application, heat-sealing application and fully automatic machine heat-sealing application. We offers various models for single line, two lines, three lines and four lines straps with width of 6mm, 9mm, 12mm, 16mm and 19mm and Co-Extrusion Plants for Two Layer or Lining on straps with high production range from 35kg to 150 kg/hrs capacity. Box Strapping Extrusion Generates Plastic Sections of Continuous Length through Plastic Extruder. Plastic Granules are melting by required elements through Plastic Extruder to form a furnished product. This Process is carried out through Various Components like Extruder, Quenching tank, first godet, hot water tank, stretching godet, online single color printing machine, embossing unit, Stabilizing unit, third godet unit and wind on core winder. Fuma has developed High-tech PP/PET Bale Strap Production Line to produce straps from Polypropylene granules. PP/PET Bale Strap Production Line Strap is suitable for manual clamping application, heat-sealing application and fully automatic machine heat-sealing application. We offers various models PP/PET Bale Strap Production Line for single line, two lines, three lines and four lines straps with width of 6mm, 9mm, 12mm, 16mm and 19mm and Co-Extrusion Plants for Two Layer or Lining on straps with high production range from 35kg to 150 kg/hrs capacity. PP/PET Bale Strap Production Line Extrusion Generates Plastic Sections of Continuous Length through Plastic Extruder. Plastic Granules are melting by required elements through Plastic Extruder to form a furnished product. 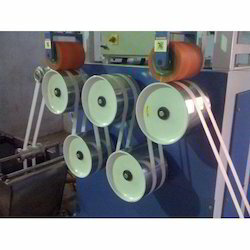 PP/PET Bale Strap Production Line Process is carried out through Various Components like Extruder, Quenching tank, first godet, hot water tank, stretching godet, online single color printing machine, embossing unit, Stabilizing unit, third godet unit and wind on core winder. Fuma has developed High-tech PP Strapping Production Line to produce straps from Polypropylene granules. PP Strapping Production Line Strap is suitable for manual clamping application, heat-sealing application and fully automatic machine heat-sealing application. We offers various models PP Strapping Production Line for single line, two lines, three lines and four lines straps with width of 6mm, 9mm, 12mm, 16mm and 19mm and Co-Extrusion Plants for Two Layer or Lining on straps with high production range from 35kg to 150 kg/hrs capacity. PP Strapping Production Line Extrusion Generates Plastic Sections of Continuous Length through Plastic Extruder. Plastic Granules are melting by required elements through Plastic Extruder to form a furnished product. PP Strapping Production Line Process is carried out through Various Components like Extruder, Quenching tank, first godet, hot water tank, stretching godet, online single color printing machine, embossing unit, Stabilizing unit, third godet unit and wind on core winder. Fuma has developed High-tech Box Strapping Extrusion Line to produce straps from Polypropylene granules. Box Strapping Extrusion Line Strap is suitable for manual clamping application, heat-sealing application and fully automatic machine heat-sealing application. We offers various models Box Strapping Extrusion Line for single line, two lines, three lines and four lines straps with width of 6mm, 9mm, 12mm, 16mm and 19mm and Co-Extrusion Plants for Two Layer or Lining on straps with high production range from 35kg to 150 kg/hrs capacity. Box Strapping Extrusion Line Extrusion Generates Plastic Sections of Continuous Length through Plastic Extruder. Plastic Granules are melting by required elements through Plastic Extruder to form a furnished product. Box Strapping Extrusion Line Process is carried out through Various Components like Extruder, Quenching tank, first godet, hot water tank, stretching godet, online single color printing machine, embossing unit, Stabilizing unit, third godet unit and wind on core winder. HEAVEN EXTRUSIONS has developed High-tech PP Strapping Production Lineto produce straps from Polypropylene granules. PP Strapping Production Line Strap is suitable for manual clamping application, heat-sealing application and fully automatic machine heat-sealing application. We offers various models PP Strapping Production Line for single line, two lines, three lines and four lines straps with width of 6mm, 9mm, 12mm, 16mm and 19mm and Co-Extrusion Plants for Two Layer or Lining on straps with high production range from 35kg to 150 kg/hrs capacity.